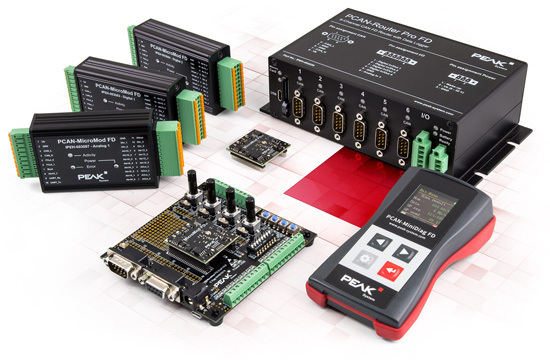 Peak-System, a company specializing in Classical CAN and CAN FD, presents its latest products at the Embedded World 2019 exhibition in Nuremberg, Germany. "Like every year before, we as a German manufacturer and provider are proud to be able to prove our long-standing know-how again", so the managing director Uwe Wilhelm. Exhibition visitors can take a look at the PCAN-Minidiag FD, which was released at the end of January 2019, and the latest PCAN-Micromod FD product series, which will be released after the exhibition. The plug-in module PCAN-Micromod FD, the development board PCAN-Micromod FD evaluation board, and the PCAN-Micromod FD motherboards Analog 1, Digital 1, and Digital 2 will be available. In addition, the first product of a CANopen series will be shown, which will be launched in the second half of the year. Access to CAN FD networks via the LAN interface of a computer is to be made possible by the PCAN-Gateway FD DR at the end of 2019. A first prototype of this Linux-based module in a DIN rail housing will also be shown. Last but not least, exhibition visitors can take a closer look at the PCAN-Router Pro FD announced for the third quarter, which is equipped with six CAN FD channels, I/Os, and data-logger and can be configured with Windows software. Peak-System can be found at Embedded World 2019 in hall 1, booth 483. The exhibition will take place from February 26 to 28 in Nuremberg, Germany. It is an important annual event for professionals from all over the world to find out about the latest embedded technologies for hardware, software, and tools.